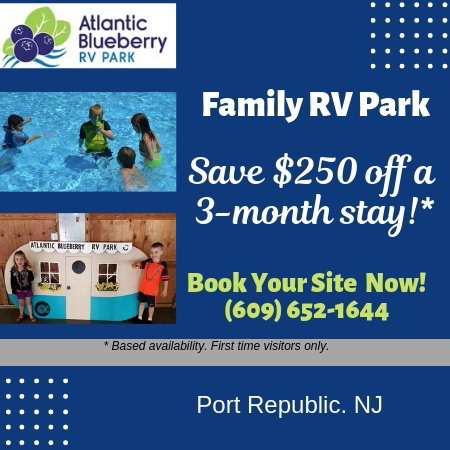 At Atlantic Blueberry RV Park, you can count on the Park’s great location, friendly people, and active programs. Our season runs from March 29th to October 27th. To assist you in selecting an RV site that works best for your camping needs and budget, we offer three site types: Water and 30 amp electric service, water and 50 amp electric service and full hookup to Basic, Premium and Deluxe sites. Weekly rate is the daily rate for 7 nights less a 10% discount. Seasonal installment plan rates are available pre-season. Golf carts for seasonals are an additional $125 fee. Golf Carts for shorter stays permitted on exception basis – inquire as to price. Off-site winter storage is $150 or on-site included in Seasonal Installment Plan. Cable offering of 32 channels is included in site rental. Free WiFi access available. Premium WiFi access available at a cost. For monthly stay or longer metered electric actual cost plus $3 administrative fee. Day visitors are $5/day and overnight visitors are $12/night. Two (2) vehicles allowed per site – off site storage $50/month or $3/day. Daily & Weekly – Reservation are taken with a $35 non-refundable deposit, which represents cancellation fee. Monthly – Reservations are taken with a $95 deposit. Reservations must be cancelled thirty (30) days prior to start date or your deposit will be forfeited. Seasonal – Reservations are taken with a $500 deposit. Reservation must be cancelled by December 1st or your deposit will be forfeited. To extend your stay, notify the office before 10:00 AM. contact us for our special program and rates.